Featuring beans and corn – the seeds of the plant! Cut stems off green and red bell peppers. Remove and discard seeds. Dice peppers into small pieces. Dice cucumber, celery, and green beans. Cut roots off green onions and discard roots. Chop green onions into small pieces. Drain and rinse canned corn and black beans. Combine all together in a large mixing bowl. In a small bowl, combine all dressing ingredients and stir well. Add dressing to ingredients in the large mixing bowl and stir until well mixed. 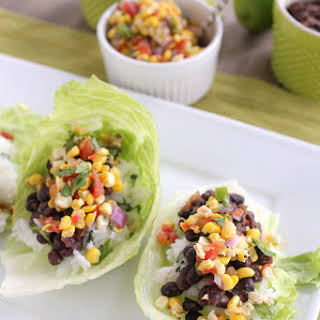 Enjoy eating as a salad with greens or as a taco on a large lettuce leaf (such as romaine) or wrapped in a tortilla! Add 1 cup cooked rice to bean filling mixture.